It’s that time of year again where we spotlight some of the best CPAP mask reviews on the market for 2016 and look ahead at new CPAP mask deals coming on the market for 2017. Name brand companies like ResMed, Philips Repsironics and Fisher Paykel continue to dominate the market with new sleep apnea therapy interfaces but some lesser known manufactures are making some noise with comparable designs and lower price points. For a new continuous positive airway pressure (CPAP) user the experience of finding the right mask may seem to be a daunting and pricey task. 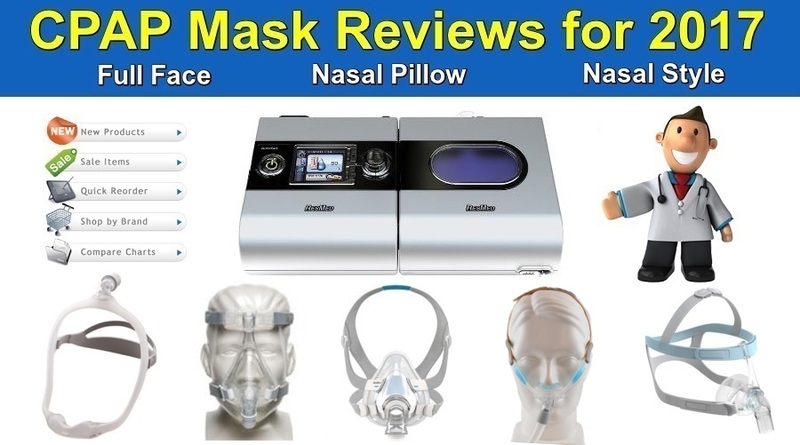 Most CPAP providers or companies will tell you what their top selling or best rated mask might be but that data can be misleading, especially if many of their long time customers have been using the same mask for years. Keep in mind that most people replace their mask once or twice a year depending on how well they clean and maintain it. Some durable medical equipment companies have exclusive deals worked out with a manufacturer and will only provide you with that manufacturers brand and not offer any other options. And then there is the companies I despise; those that only offer you the mask they can get for the lowest price. 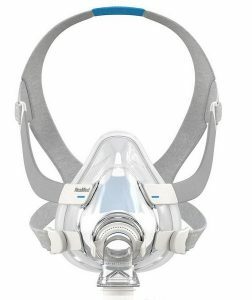 Seasoned CPAP wearers typically stick to the same mask they find to be the most comfortable but should look at what is new with the brand they prefer to see what kind of modifications have been made to an existing mask family. A good example of positive innovations would be the ResMed Swift series of nasal pillow masks. I personally use the Swift FX however I have changed my headgear from the standard model to the Bella straps. Long time users also have to adapt to change as some masks have been discontinued so this will force them to switch when their preferred mask is no longer available such as the Respironics GoLife series of nasal pillow masks. Below we have listed a few masks and categories to help both the new user and seasoned user alike. While many manufactures have multiple masks available in each style, we have highlighted a few from each to consider. Nasal Pillow CPAP Masks – the least invasive style of sleep apnea masks, it usually consists of a small pillow cushion that has inserts for the nostrils and often only uses a single strap. 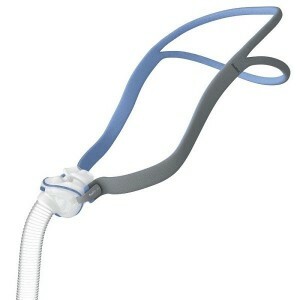 These masks are mostly recommended for people that have CPAP machine or Auto CPAP pressures less than 10cm/H2O. People with mild or moderate sleep apnea, snoring or upper airway resistance are ideal candidates. They are also a good starting tool for people that are having a difficult time adjusting to sleeping with a mask on their face or suffer from claustrophobia. The pillow cushion inserts and headgear straps can be replaced separately and should be changed every 3 months or once noticeable wear and tear or leaking occurs. 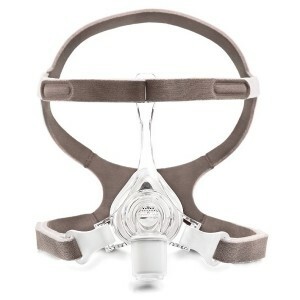 CPAP Full Face Masks– these masks are most popular with users that are on higher CPAP or BiPAP (bi-level) pressures. Covering both the nose and mouth these interfaces allow people to breathe through their nose and mouth, a typical way the average sleep apnea suffer sleeps. Many people find the pressure of CPAP when they are first introduced can be a bit overwhelming and the use of a full face mask offers relief from difficulty breathing through the nose only. Once a user becomes acclimated to sleeping with CPAP the sensation of the pressure decreases and some users can switch from full face masks to lesser invasive nasal or nasal pillow masks. Full face masks are prone to higher mask leaks and it is important to clean the cushion surface nightly to remove facial oils or makeup. Replacement cushions and headgear are available for these products and should be changed every 3-6 months or as needed. If you find yourself over tightening your headgear to get a better seal or hear/feel air leaking it is either time to replace or clean as needed. CPAP Nasal Masks– Once the most popularly prescribed interface, the nasal style is a triangle shaped design that covers the nose only. These masks are lighter weight than the full face but heavier that the nasal pillow style. Nasal styles are mostly recommended for people that do not need a full face mask and may be irritated by nostril inserts of the pillow style masks. The same cleaning, maintenance and replacement schedule applies for this style. A pro to these masks would be price point as they are often cheaper than the nasal pillow and full face. Best CPAP Masks for Side Sleepers– For those that like to switch from side to side during the night the hassle and aggravation of a mask digging into your face can be annoying and painful for sleeping. The CPAP “battle scars”, red mask line marks on the face from the strap or cushion digging into your face, can be embarrassing. For Full face users there is not many ways around this but for nasal pillow users or nasal style users there are some options that can make these side effects less painful. Best CPAP Masks for Mouth Breathers– There is no easy way around this one other than a full face is your only option. There are a couple of full face masks that differ in design and offer a hybrid style of nasal pillow while still covering your mouth like the ResMed Mirage Liberty. Hybrid masks work best for people that need a full face for mouth breathing but have a narrow nose bridge that make it difficult to seal around the eyes. SleepWeaver offers a cloth style full face that can help with people that also suffer from side sleeper issues. Non Prescription CPAP Masks– Most people don’t realize that they can purchase their mask and headgear separately and avoid the hassle of trying to track down their prescription. We offer all of our masks with optional headgear to assist people with expediting their order. It’s quite simple if you think about it, all you have to do is attach the headgear which you were going to adjust anyways. We do encourage all of our customers to provide us with a copy of their prescription or their physicians information so that we can obtain a copy but just in case that’s not an option available you can rest easy knowing you can still get your CPAP supplies hassle free.